Solar power took the lead in new capacity additions for 2016 expected to be greater than 9.5GW of utility scale plus 4.5GW of distributed installations. The numbers could possibly be even higher with 2016 utility scale solar being so aggressive and 4th quarters being mecurial. When accounting for capacity factor (amount of time the hardware is actually pushing electrons onto the grid), solar power is 31% of new electricity, natural gas 41% and wind 20%. Solar almost doubled from 7.3GW in 2015, finishing third for overall US utility capacity additions. The most powerful part of this report is that for at least the next 30 years that new solar volume will be producing clean electricity. No further labor–apart from very light maintenance–will be needed to keep the hardware running. The United States will have installed 39GW of total solar capacity, growing 19x since the 2GW total in 2010. 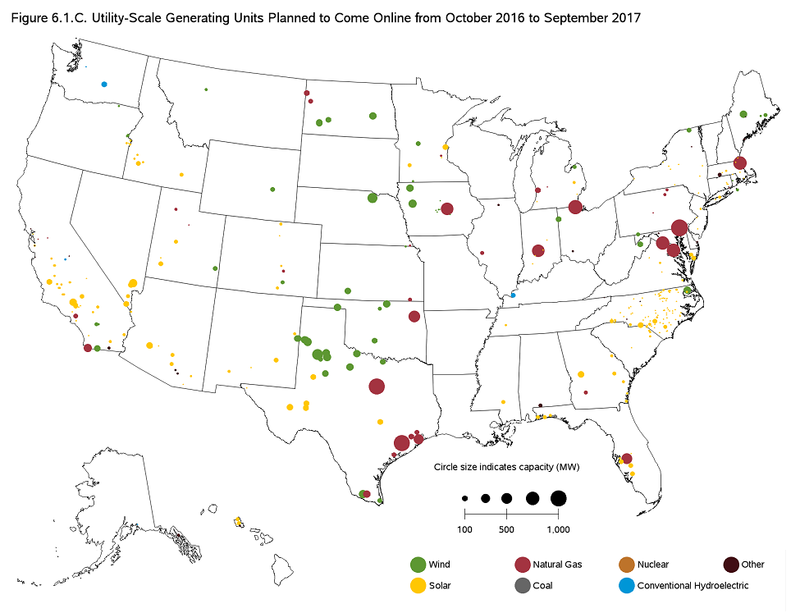 The top five states where utility scale solar capacity is being added are California (3.9 GW), North Carolina (1.1 GW), Nevada (0.9 GW), Texas (0.7 GW), and Georgia (0.7 GW). There will be around 400,000 individual residential installations across the country, with over 14 states contributing more than 15,000 installations each. There are some market perturbations going on: currently in the residential solar market we are seeing a transition from solar leasing toward cash sales. This transition led to the 3rd quarter showing the first quarter over quarter slow down. The commercial-industrial market grew to a record size, with off site generation feeding their main structures via community solar. The 1-10MW marketplace continues to grow (smaller than utility scale and mostly used to feed corporations or groups of consumers). In 2017 we should see solar power stay in first place, expanding the total amount of volume installed. Within three to four years we should see solar power take the lead in both new generation and new nameplate.